On my day off, I had a TON of errands to run. I barely made it past the bank when I realized I was starving. 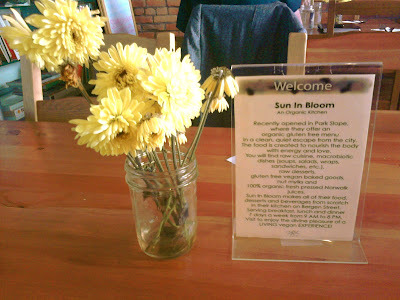 I was just around the corner from Sun in Bloom - a new-ish (January) vegan restaurant I have been meaning to try. When I saw the chalkboard outside proclaiming: GLUTEN FREE PANCAKES, I had to at least stop inside. Just a peek, I told myself, knowing I was on my way to Target and that it is impossible to step inside that glowing center of capitalism without spending at least eighty dollars. Feigning interest in the to-go menu, I scoped the place out. 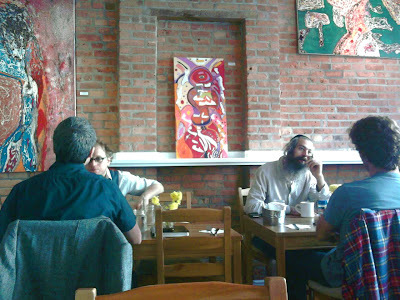 By the time the waitress asked if I wanted to sit down, I was so worn down by the selection of gluten-free baked goods and the promise of gluten-free bread on the menu I conceded, and took a seat at one of the four wooden tables. What a nice little place! I asked the waitress what on the lunch menu was gluten-free, and she told me: "everything." Then I asked about the bread (the menu says you can order a side of it, warm, with almond butter). She told me they didn't HAVE IT and haven't had it since she started working there—but they might get it again in the fall. I'm sure my face fell, and she promised me that all the other baked goods (all of them) are gluten-free. You can order any of the wraps in greens instead of their sprouted wheat wrap—and maybe come autumn, on bread. I ordered the Morning Energizer Burrito which had brown rice. 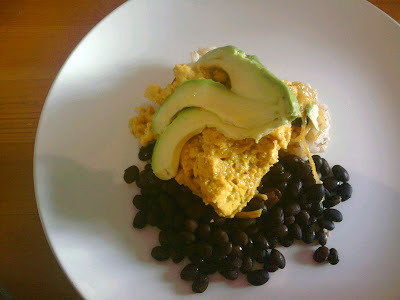 The spicy tofu was delicious—can't complain about an avocado—the only complaint was the black beans were quite dry. I pretended it was a textural decision and chewed away, enjoying the sunny view of Bergen Street, pretending I was in Berkeley. So I had to get dessert, duh. 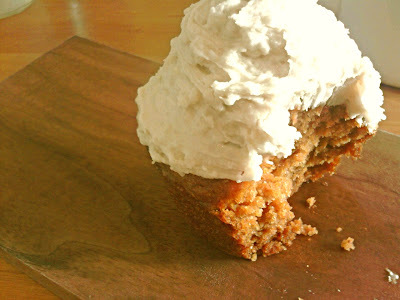 I tried this carrot cake cupcake with coconut frosting—the texture was to die for. It had a slight taste of (buckwheat, maybe?) gluten-free flour, but the overall experience was great. 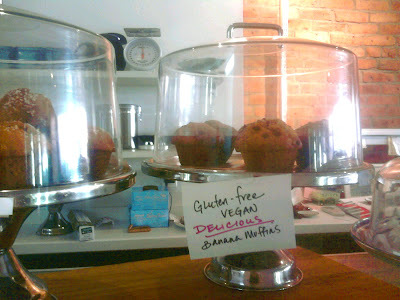 Last but not least: you feel good about yourself after eating an entirely gluten-free vegan meal. I have to say: I had a super-energetic day and I don't doubt it was the quality and nutritiousness of this food! It's also a nice place to go by yourself—they have a wide selection of books (about lifestyle, nutrition, etc.) on the shelves if you forget your own reading material. They also have fresh juices ($$$) and coconut kefir and raw mousses for dessert. I'm dying to go back for the brunch pancakes, and the "Create Your Own Miso" soup! I'll bring my veggie roommate! Finally, a place where we can all get along.